We manufacture and supply finest quality Automotive Clutch Facings that are manufactured from highest grade raw materials. Our Automotive Clutch Facings are acknowledged in the market owing to their superior performance and high resilience. We duly test our Automotive Clutch Facings before delivering them to the customers ensuring their high and error-free working. 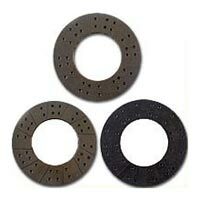 Avail from us Automotive Clutch Facings according to the different specifications of the customers.